The X4 might just be the smartest car BMW has made. Now before you all try to revoke my Jalop card, let me explain. The X4 is a compact crossover, you know who wants compact crossovers? EVERYONE! O.k. not everyone, we want wagons and Miatas, but the people that actually buy new cars want compact crossovers. I shop cars on behalf of customers all the time, and compact crossovers are the most popular segment. In fact the hottest car this year for my clients is the Audi Q5, and the people that can't afford the Q5 usually end up with a Subaru Forester. I swear Subaru should change their tag line to- "Too broke for Audi? We have AWD too!" Why do all of these people want compact crossovers? I'll give you a hint...it's not because they are practical. They want them because and I quote, "I like the looks and I need AWD for bad weather." Yes, I know...something, something, tires blah, blah, blah...they don't care. The X6 is stupid because folks in the mid-size segment actually care about space. They have a family to move around, or a lot of fancy dogs, or maybe (and this is like 2% of the population) they have to tow something. Mid-size SUV buyers are really people who are just trying to avoid a minivan. Compact crossover buyers aren't getting these vehicles as family haulers. Compact crossovers are lifestyle vehicles. Remember the Evoque? Everyone lost their minds over that car. Yes, it has a very advanced AWD system that will allow you to cross the Sahara desert, but no one is going to buy it for that. The Evoque sells because it looks cool. 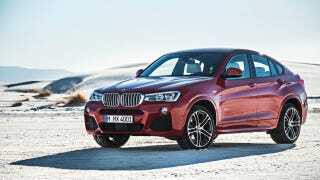 The X4 will sell because it looks cool. In fact I don't know why BMW is taking so long to make an X2.